When you’re on holiday it’s a great time to slow down a little and try your hand at a hobby you don’t usually have much time for, such as sketching. 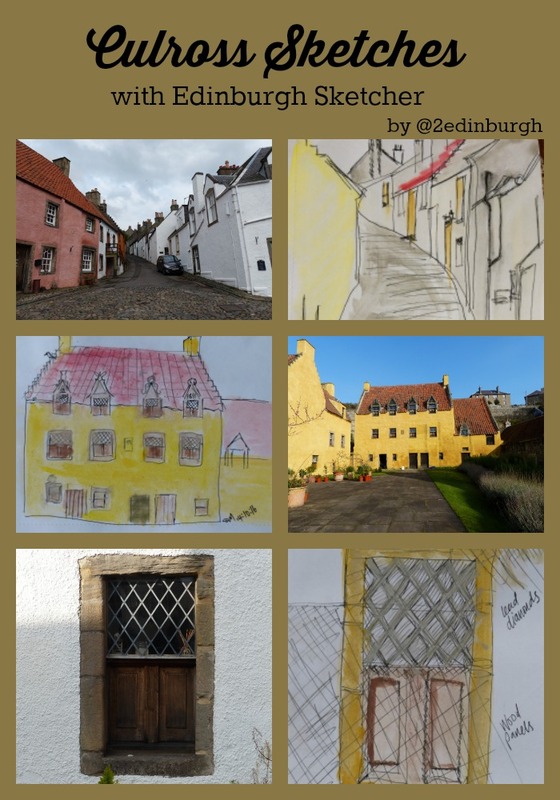 We’re incredibly lucky in Edinburgh as there’s an inspirational sketcher around the city, Mark Kirkham, better known as the Edinburgh Sketcher. 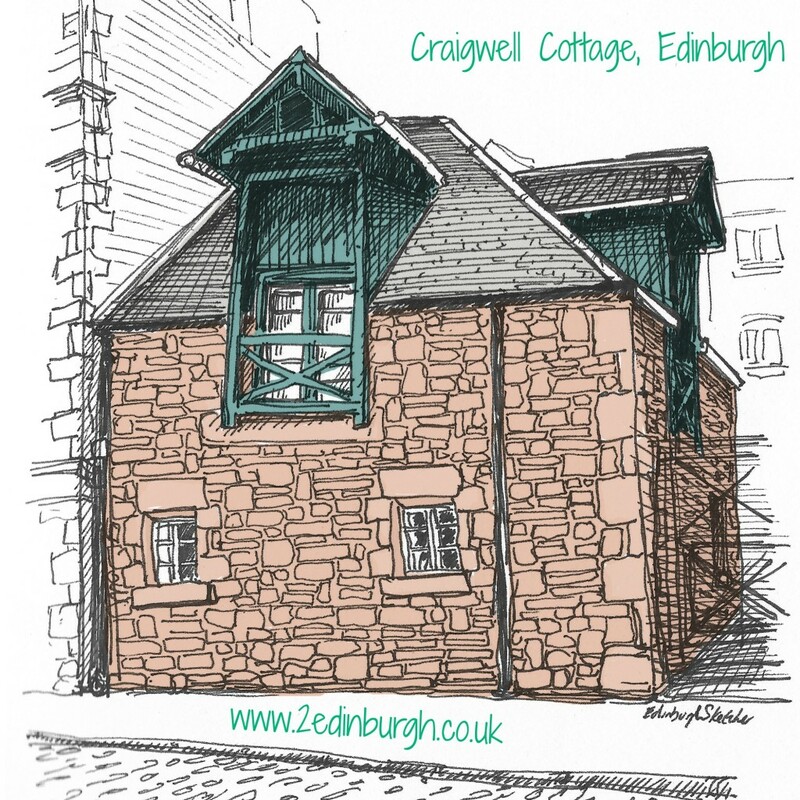 When he went freelance, one of his first commissions was a drawing of Craigwell Cottage! So when I spotted on Instagram that there was going to be a sketching tour of one of my favourite places to visit, I jumped at the chance to join in. The tour was organised by the National Trust for Scotland in connection with their Little Houses project. As well as sketching we had an introductory talk about the Little Houses scheme by Diane Watters of Historic Environment Scotland. 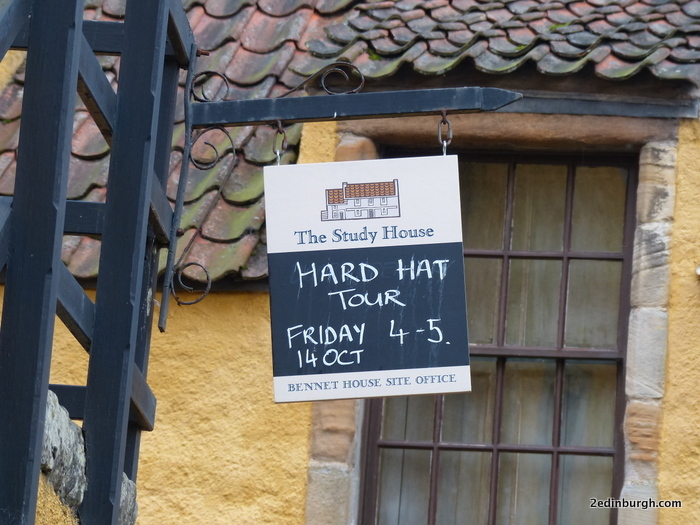 Our day concluded with a “hard hat tour” of Bennet House accompanied by Brian Wilkinson of the National Trust for Scotland. Brian leads tours to educate visitors about the conservation work on the property. The introductory talk by Diane covered the origins of the National Trust for Scotland and the Little Houses Improvement Scheme. We learnt about the free exhibition currently running in the Town Hall at Culross. 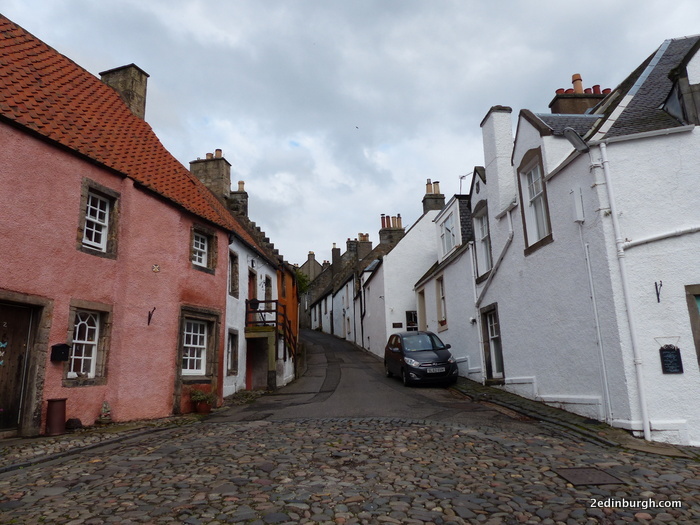 I knew a little about the scheme, as Sandcastle Cottage in Crail is near the very first properties which were conserved under this scheme – the houses at 5, 6 and 7 Rumford, Crail. During our sketching tour we ducked in to the exhibition for a few minutes, to see the display and protect our sketches from the rain! 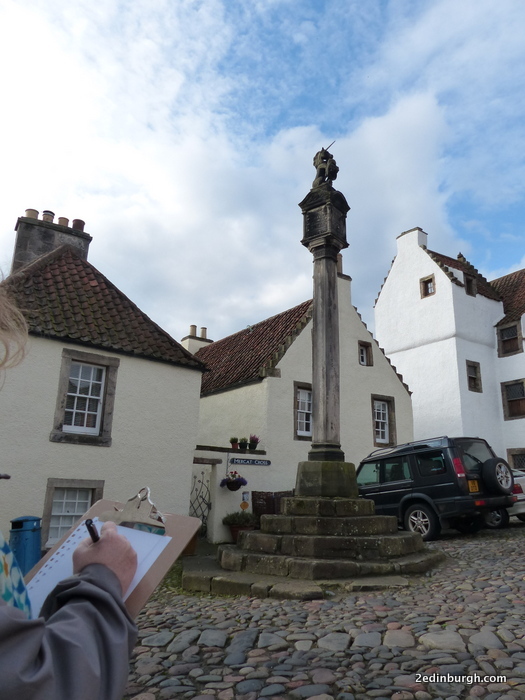 Edinburgh Sketcher started off our sketching tour by taking us to the front of Culross Palace and encouraging us to look at the regularity of the shapes, placing large rectangles on the page, then looking at how to divide up our sketches by putting markers where some of the features of the building appeared, then working on adding some of the details. 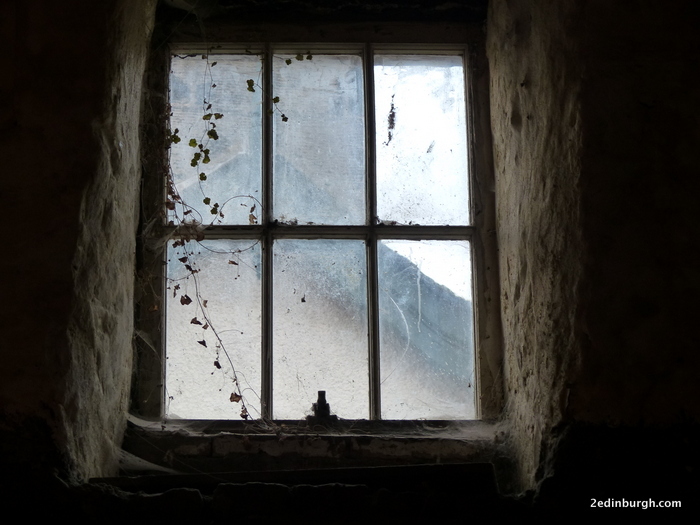 It was fascinating to look at the different decorations above the windows and see the ways the stonemasons had added different touches, including a date for the building of 1611. We then headed up Mid Causeway to stand on the cobbled street and look towards The Study, which is where we started to look at a more challenging prospect and think about the perspective of a wall along the side of the street, and Brian, who’d joined in the sketching tour, explained the story of the cobbles in the centre of the street being easier to walk on as they were flatter and larger, and in days gone by they would have been reserved for the gentry to walk upon while the poor servants walked on the more challenging smaller stones. 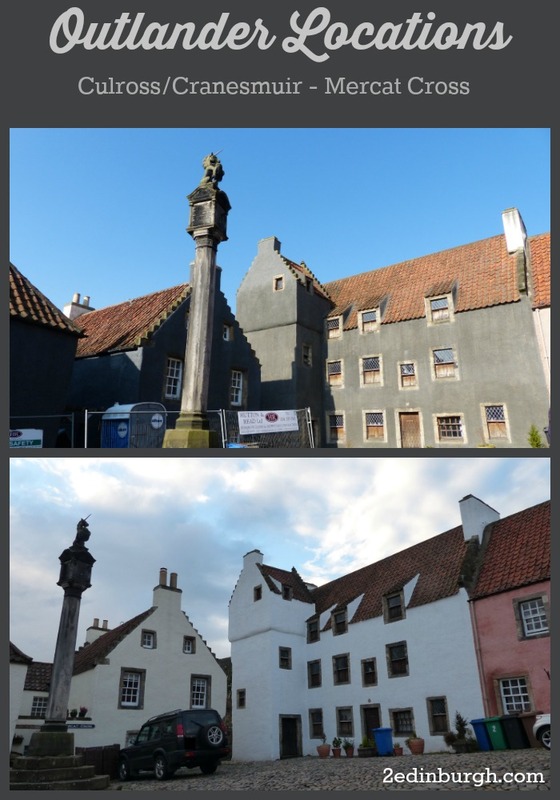 The building in the centre of the picture above is The Study, which as well as being an historic building in its own right, also provided one of the locations around the square where the Mercat Cross can be found which was used to film some of the episodes of Series 1 of the Outlander-STARZ tv series. As we were standing in the street, a local dog walker came up to speak to us and provided some history of the local area from more recent times, talking of the pits and the Valleyfield pits. We soon got on to the subject of “Floating Bob” or Sir Robert Preston whose name we’d come across in our walk round Preston Island. We then headed into the square where the Mercat Cross stands. While we were concentrating on our sketching, it was amazing to see the different tour groups arrive and wander round the square looking at the various scenes and trying to imagine how it looked in Outlander. As we had a historian in our midst, I could sense a little element of frustration at the fact that people were here to hear about a fictional story, and an imaginary village. However, we did agree that it was better that people were coming in the first place as the fiction contains threads of the real history of Scotland, and while they are here it’s an opportunity for those of us in tourism to tell some of the other stories, and perhaps interest people in finding out more about the events which were every bit as gruesome as those depicted in fiction and on TV. Less than an hour before we had been looking at putting rectangles together to represent a house. I remarked that we had come an awfully long way to being in a position to draw unicorns! 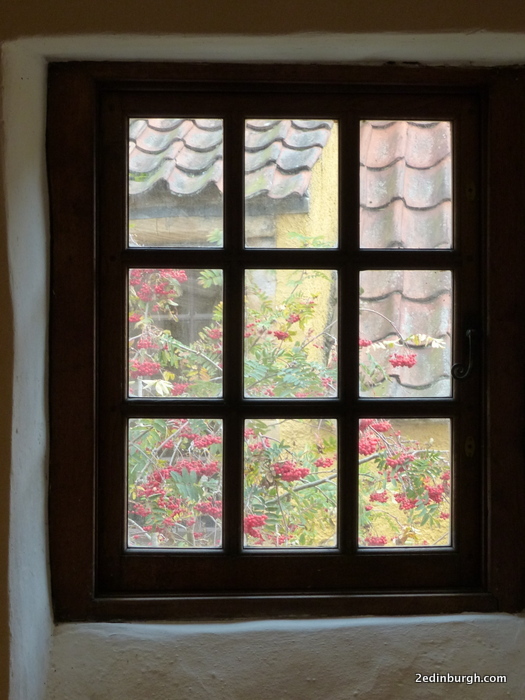 We relaxed a little after the unicorn challenge and turned our attention to one of the windows of The Study, and Mark encouraged us to draw the diamond shapes of the panes rather than the lead surrounds – too late, I’d already cross hatched my page! As I was looking at the window, I could recall a scene from Outlander Series 1 where Geillis Duncan and Claire Beauchamp were standing at one of the upper windows of this very building, looking down at the scenes unfolding in the square below. While we were concentrating on our sketches, and probably being included the in the photographs of the various tour groups, I noticed that people were having difficulty recalling the scenes from the movies and where they’d actually taken place. 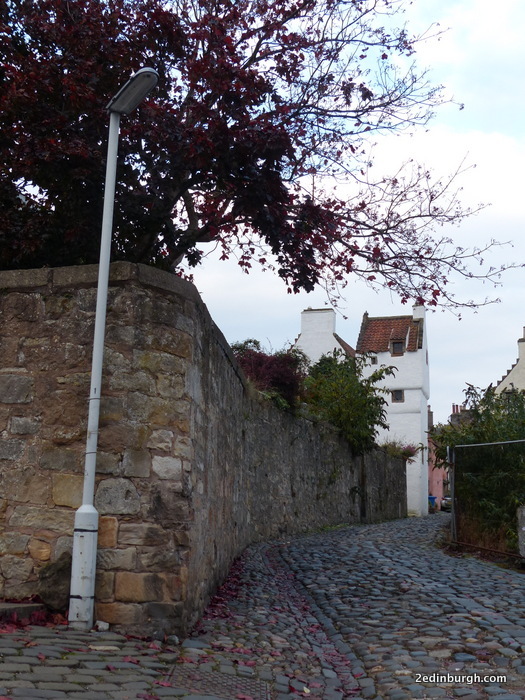 There were a couple of visitors who’d come through from the west of Scotland for a day touring around Fife, who were asking local passers-by which doorway was the one where Claire had gone in to tend to the little boy who had been poisoned. On my return home, I spent a while looking at Episode 3 of the first series of Outlander: “The Way Out” to find all the scenes. It set me to thinking about the experience of visitors who have come from some distance (one who spoke to our sketching group had come from Missouri), and how they have to use their imagination to see the stocks and pillory which were erected in the square. Then of course, there was the fact that several of the buildings around the square had been painted grey for the filming, before being returned to their more usual white colouring. I’d fortunately kept a photograph of an earlier visit to the village, at a time between filming where the buildings were still grey, which I’ve included for reference below. 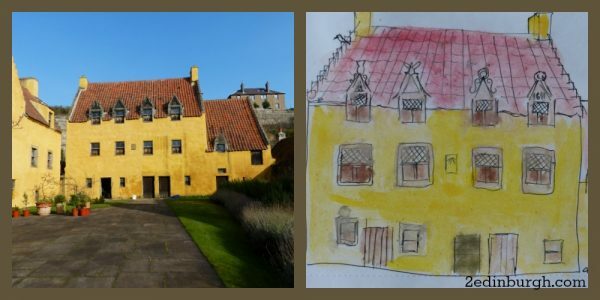 Meanwhile, musings about Outlander aside, we next turned our attention to the upward slope of Tanhouse Brae, and our next sketching challenge. Mark suggested that we look at the cream-coloured drainpipe to the left of the street, on the rust-coloured building. We drew a line on our page to represent the size of that pipe, then an upward curve to represent the right side of the street as the angle of the perspective met the pipe. From there, we then drew perpendicular lines to mark the edges of each of the houses, then started to fill in the details such as windows, roofs, chimneys and so on. On the way back to base, we took a detour up Haggs Wynd and along the back of the Palace garden where there were great views over the village, and where Mark had spent some time earlier sketching an inspirational scene which he had on display to inspire us. 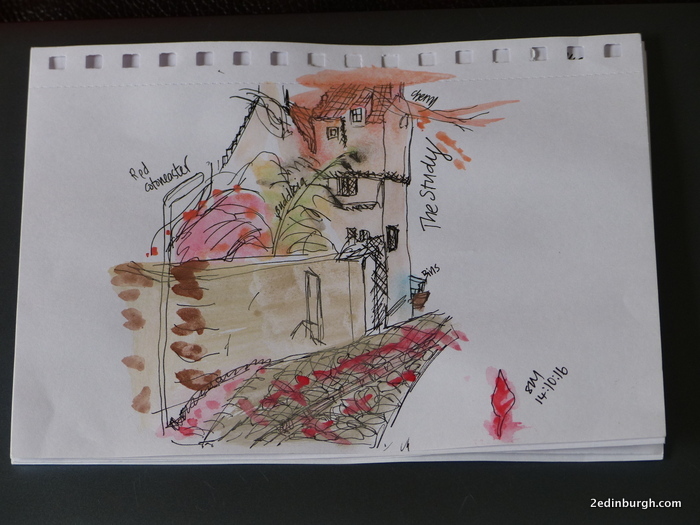 Armed with the sketching we had done – outlines only with a Staedtler 0.5 mm marker pen up to this point – we returned to the National Trust building where Mark had set out paints and water for us to work with. 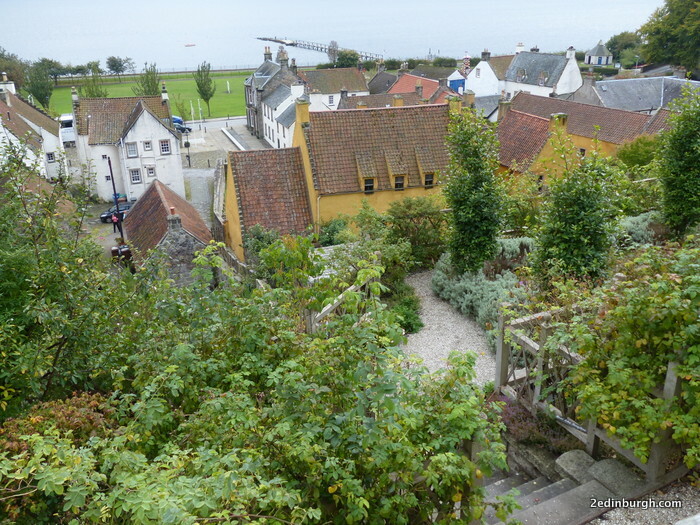 I took a quick picture out of the window before starting to work on my sketches, as it was such a pretty scene with the rowan berries ripe against the bright yellow colour of the Culross Palace building. We worked away washing the first layer of colour over our sketches with broad brushes, then returning to them once they were dry to add further layers of colour and complete our artworks. Mark gave us a card frame to select the best ones to display. The sketching part of the afternoon had been such fun, and there was so much to learn from simply being outside and working away at a reasonably speedy pace to jot down our impressions of the scenes. It certainly helped that we were able to exclude some of the street features, such as bins and cars to produce something more pleasing to the eye. Our very own artistic licence. It was a surprise that we’d been so busy concentrating that it had reached 4 pm and time for our Hard Hat tour. Brian Wilkinson took the sketching group and some further visitors who had assembled to inspect the interior of Bennet House which is being used to study the progress of renovations. The property is being divided into two houses to form small homes which will be sold on the open market once renovations are completed. The hard hat tour accessed both properties. 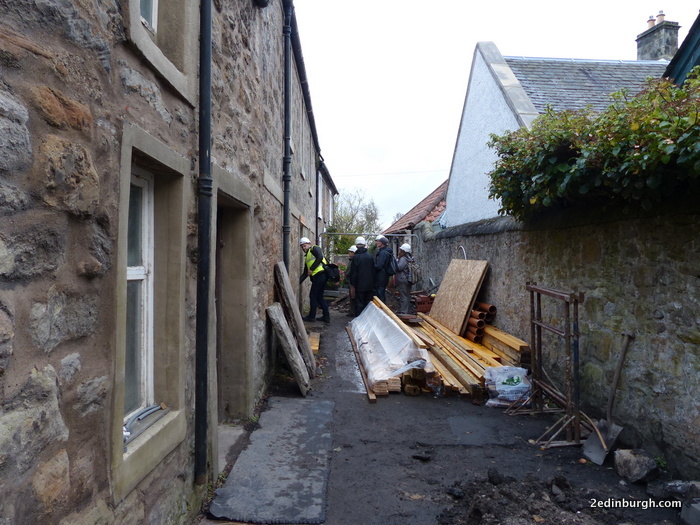 Some of those on the tour had been following the progress and were interested to see how it was going. To those of us there for the first time, it looked like there was an amount of work to be done to get them ready for habitation again. If you’re interested in following the progress of Bennet House, then the Events page has details of when hard hat tours can be made. For future Edinburgh Sketcher outings, you can find details here. 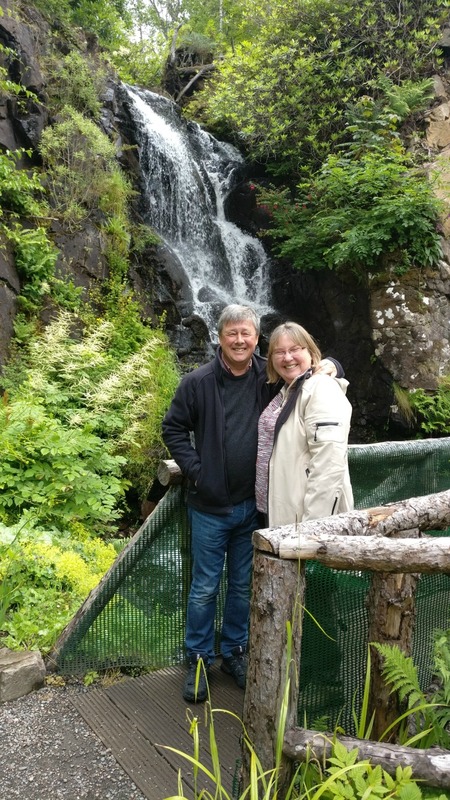 To base yourself in Edinburgh as an independent traveller exploring central Scotland, simply select your desired date from our “Book Now” calendar to obtain a quote and book a stay in central Edinburgh. 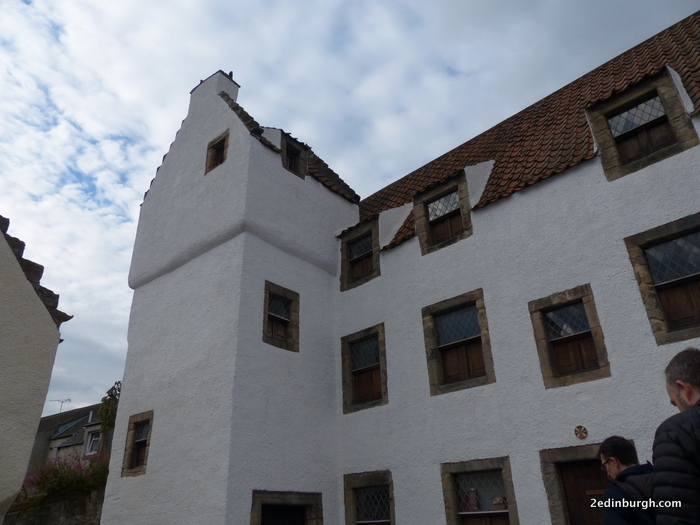 We’ll be adding more information about Outlander Locations to explore as we discover more, and you can read some of our previous Outlander Articles to inspire you.